Garage48 H&A 2016 has come to an end. What used to be just piles of materials on Friday are now shaped into 19 working prototypes. The hardware hackathon held 143 awesome participants + 20 mentors, organizers & volunteers, altogether around 190 people who made this event happen. 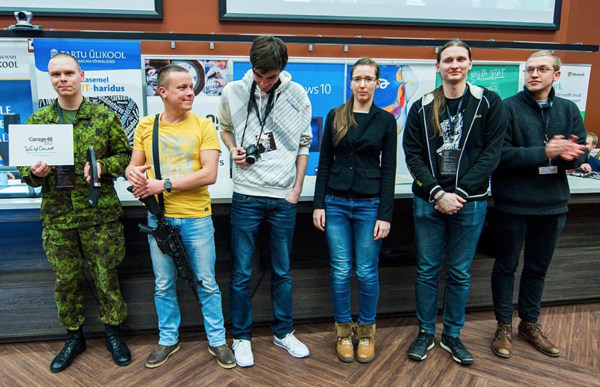 The event was once again organized in co-operation with the Estonian National Defense College. They were actively participating with their very own projects: InfusionWarmer, False Radio Network, Smart Ramp and WulfCount. 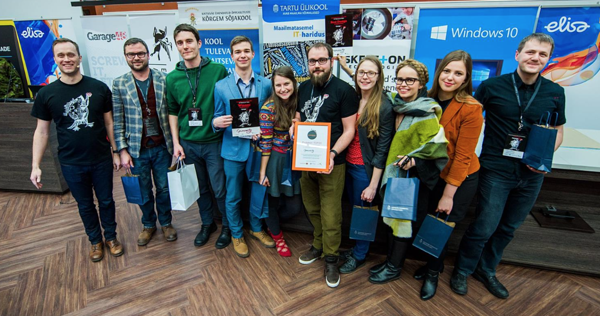 The teams were guided by our talented mentors: Jaanus Kalde (Krakul), Jaan Kruusma (7Blaze), Elise Sass (Microsoft), Martin Melioranski (Estonian Academy of Arts), Kärt Ojavee (KO! ), Lauri Hirvesaar (Cleveron), Siim Lepisk (Prototron), Martin Terav (Eccom), Andreas Annama (Eccom), Pirko Konsa (Arengufond), Sten Allik (KVÜÕA), Indrek Narusk (Viks/CrabCad), Aleksei Solovjov (Rohde&Schwarz), Vahur Afanasjev (Hitafly), Marcin Borecki (Microsoft/CloudExpert), Villu Teearu (Elisa), Raido Kalbre (Elisa), Indrek Rebane (Hedgehog), Priit Salumaa (Mooncascade) and Alvo Aabloo (Tartu Ülikool). A big thanks to the mentors! The opening words were given by the head of the National Cyber Security Policy Section at Latvia's defence ministry and the First Lady of Estonia Ieva Ilves, who expressed her pride in the young people of Latvia and Estonia working together. The 19 prototypes that were delivered on the stage made a real impression on her and she was very thrilled to witness them. 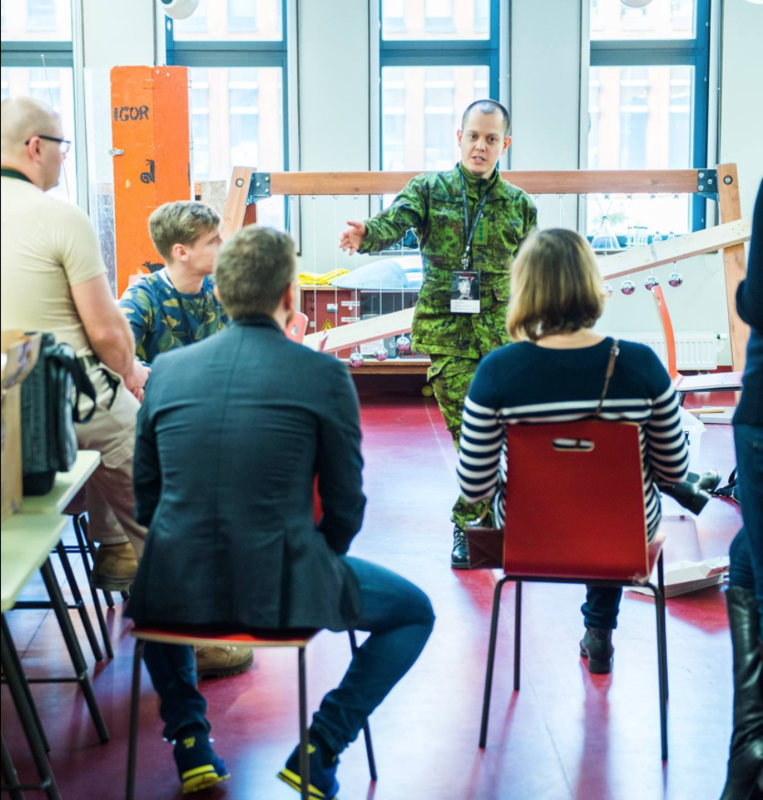 The teams were assessed by our wonderful jury members: Priit Salumaa (Garage48, Mooncascade), prof. Alvo Aabloo (Tartu University), Indrek Rebane (Hedgehog), Sten Allik (Estonian National Defence College), Villu Teearu (Elisa), Toomas Tammis (Estonian Academy of Arts), Pirko Konsa (Estonian Development Fund), Elise Sass (Microsoft) and Ieva Ilves (Ministry of Defence of Latvia). 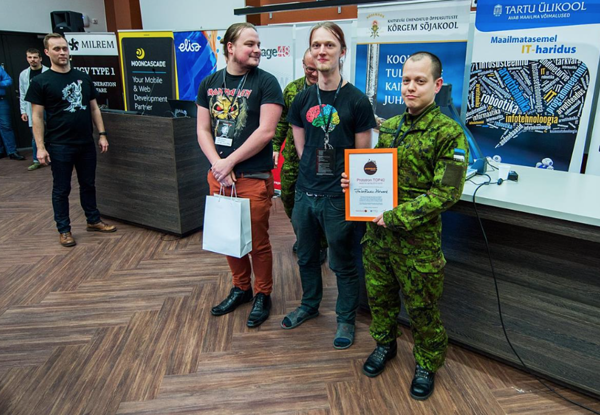 Prizes: a bag full of practical equipment for survival in the Estonian climate from the Estonian National Defense College + paid private hackathon + Prototron Top 20 and a 3-day accelerator program + goodie bag + artwork/designs from the Estonian Academy of Arts. Genosity is a gene testing machine that anyone can use anywhere. Our first target market is school system, because studies today have very much theory and very little practice. Using our system, every student can learn about their own genes in biology class. Affordable music visualizer for individual performers and small bands. False Radio Network is device that is able to replay recorded radio signals in a way that those signals sound and seem authentic military radio signals. That project aims to deceive enemy radio reconnaissance units. 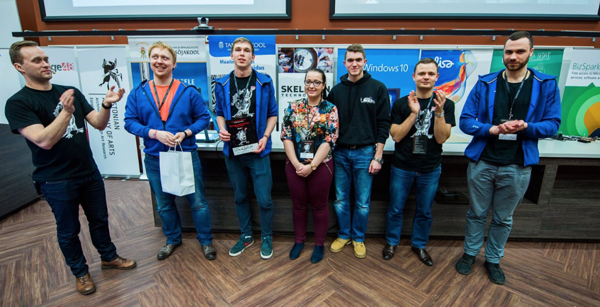 Team members: Veiko Dieves - team leader, Erik Ilbis - radio engineer, Dmitrijs Čulkovs - radio engineer, Jaanus Kalda - radio engineer, Kalle-Kustav Kruus - radio engineer. “They succeeded in solving a technically complicated problem, their device is actually usable. I even got a call from a member of the board of Prototron who really wants to meet them,” noted Siim Lepisk (CEO @ Prototron & Business Mentor @ The Founder Institute). Teasla Model T is a tea machine for busy people who value good taste and design. 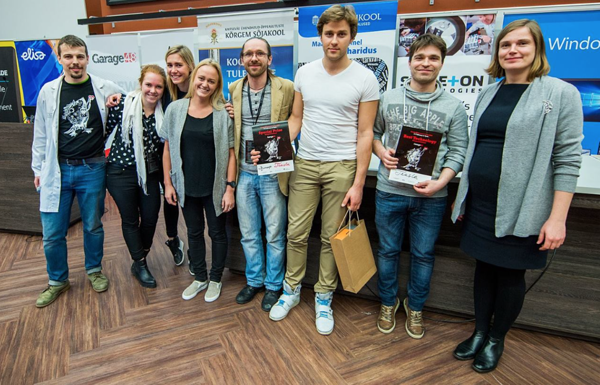 Team members: Janis Mucenieks - Team Leader, Sven Kautlenbach - Electronics, Brett Astrid Võmma - UX Design, Maarja Liiv - Product Design, Siim Leiten - Mechanics, Helen Habakuk – Marketing. Jasper August Tootsi is a high-school student who had to go through hoops to participate in the hackathon. Prize: a bag of goodies. Track My Ride is a great tool for logging information about car usage. Track your car mileage, fuel usage and drivers' history. Team members: Kārlis Babris - server programmer, Ervīns Patmalnieks - electronics, Guntis Šusts - server programmer, Zintis Mazdrēvics - frontend developer, Lelde Bērziņa - designer, Kristaps Skutelis - marketing, Pāvels Reško - server programmer. Wulfcount is device that counts how many bullets there are left in your cartridge magazine and displays the number on a screen. Siim Lepisk (CEO @ Prototron & Business Mentor @ The Founder Institute) invites Wulfcount to participate in Prototron as well. He sees a real need for the product in the market and we could really help them with their next prototype, both moneywise and businesswise. Prize: World map + exclusive mentoring & brainstorming session with Mooncascade co-founder & sales wizard Karen K. Burns. LED shirt controllable by smartphone. 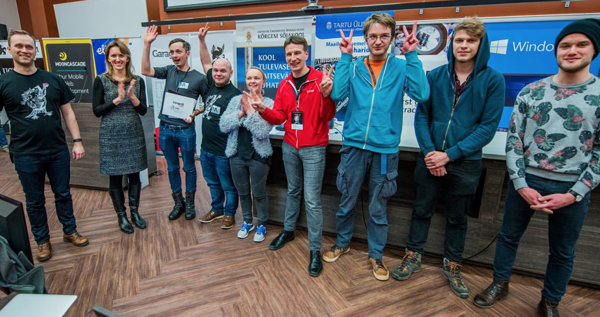 Team members: Kristjan Järvan - team manager, Tiit Rätsep - electronic engineer, Ronald Tammepõld - developer, Arya Sohrabizadeh - ux/ui, Egija Gailuma - marketing, Janis Sauss - marketing, Andreas Krigoltoi – design. Garage 48 Hardware & Arts 2016 is over. Prizes were granted, experience gained, teams formed and fun had. It was an incredible event, a big thanks to the organizers and volunteers. The DigiLab guys from University of Tartu, who were in charge of the whole equipment meca: Teet Tilk, Renno Rehtla, Lauri Mihkels, Artur Abels, Alo Peets ja Karl Oskar Lember. Our wonderful and unstoppable volunteers: Kristel Kont, Mare Sabolotny, Aija Auziņa, Kaido Kruusamets, Marie Jaksman, Marianne Kosenkranius, Anni-Brit Remmelg, Sunjai Nakshatharan and Iiris Lüsi. You rock! Some thanks to ourselves as well: Priit Salumaa, Indrek Rebane, Alvo Aabloo, Anu Piirisild, Triin Liiv, Mariana Raudsepp and Kai Isand. Special thanks to our über-talented photographer Maido Parv! Merci! Also, a very-very special thanks to our sponsors without whom this event could not have taken place: Estonian Academy of Arts, University of Tartu, Estonian National Defence College, Microsoft, Elisa, Hedgehog, Eccom, Estonian Cultural Endowment, Mooncascade, Mass Portal, Milrem, Estonian Development Fund, Startup Estonia, EU Regional Development Fund, City of Tartu, Rohde & Schwarz, Skeleton Technologies and Estonian Gambling Tax Council.